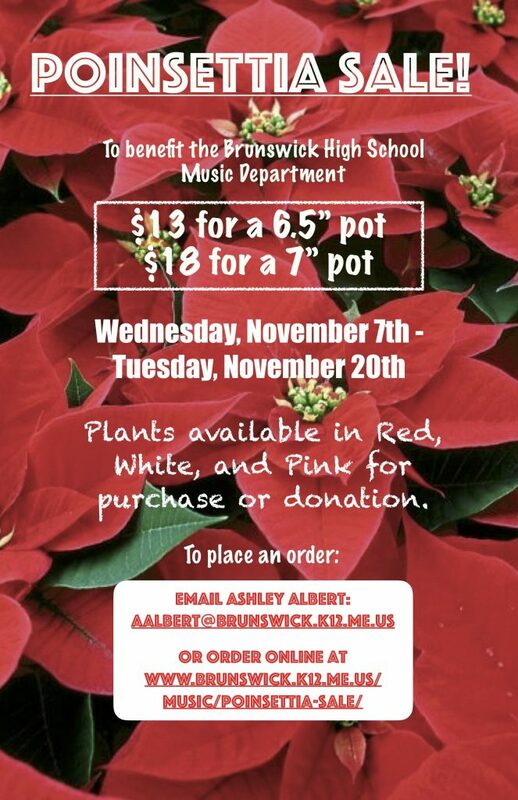 This is a letter to alert you that the BHS Music Boosters will be sponsoring our annual POINSETTIA SALE at Brunswick High School this month! The sale begins for the general public on WEDNESDAY, November 8TH, and concludes on TUESDAY, November 20th. The Poinsettias will be available for pick up on Saturday, December 8th. The cost per Poinsettia is $13.00 for a 6.5” single stem pot and $18.00 for a 7” double stem pot! Plants come in red, white and pink. Checks should be made out to “BHS Music Boosters”. THE DEADLINE FOR ACCEPTING ORDERS IS TUESDAY, NOV. 20TH!!! Last year we sold 300 poinsettias, and we are looking to sell 100 more this year!! Help us to reach our goal!!!! Back again this year, we are excited to allow the opportunity for supporters of BHS Music to give back to the community by involving Meals on Wheels and People Plus with our fundraiser! Instead of just buying plants for your own home, you may now purchase a plant to be donated to a homebound senior in the Mid-Coast Region through Meals on Wheels! What is the Meals on Wheels program? Spectrum Generations Meals on Wheels is based out of Brunswick and is a program that provides delicious, nutritionally balanced hot meals for homebound seniors in the Mid-Coast Region. This is available to any homebound individual 60+ years of age and to persons with a disability who are unable to prepare a meal due to physical or mental limitations, and who have no one to prepare a meal for them. Dedicated volunteers and staff deliver meals to the front door. This also provides an opportunity to check in on each person as a safety measure. Imagine how happy you can make an isolated elder or disabled person when a beautiful plant accompanies their meal! Students who have elected to attend the trip to Disney this spring have the opportunity to make money DIRECTLY TOWARD THEIR TRIP COST! How does this work? STUDENTS ATTENDING THE DISNEY TRIP WILL MAKE $5 OFF OF EVERY PLANT THAT THEY SELL, REGARDLESS OF PLANT SIZE, TO GO DIRECTLY TOWARD DEFRAYING THE COST OF THEIR TRIP! This counts for any and all sales made by the student, whether or not they are plants purchased for donation. This is an exciting opportunity for students attending the trip to make a good amount of money toward their bill! If a student sells 25 plants, they would make $125 toward their trip! Hopefully this helps to make the trip more affordable, and takes some pressure off of families! Be creative about who you sell to – you can walk up and down your street, have your parents (or you) ask around at their place of work, ask local businesses or even churches! Let’s reach as many community members as possible! The Music Boosters provides the department with funds to help defray costs of trips, music, supplies, CDs, equipment etc. We would ask that all families of BHS music students consider helping us support what we feel is a worthy cause. Businesses delivery teams on Saturday afternoon December 8th (VERY much needed)… this may be done with your son/daughter. Parents connected with the other Brunswick schools/businesses to help with sales of Poinsettias… this may simply involve putting up a poster and being the “go to” person for taking orders at that site. Thank you so much for all that you do to support BHS Music. Please feel free to contact us with any questions or concerns!